Will Nike and Apple be crushed under the weight of their own coolness? You knew it was only a matter of time. Not content to be the two companies with the coolest ad campaigns, Apple and Nike are continuing their devious plans to control all things hip and cool. 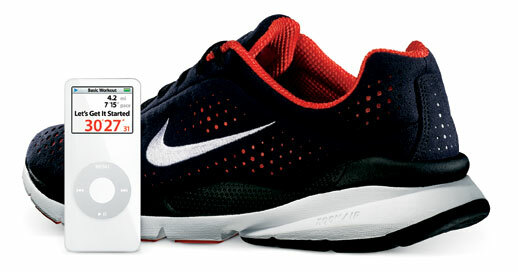 It seems they have teamed up to provide special technology “linking” one’s athletic shoes with one’s iPod. Specially equipped footwear (anyone else remember when we called them sneakers, or am I showing my age?) will send information on a runner’s time, distance, calories and pace to an iPod’s screen and through its headphones. According to a release, Lance Armstrong thinks it’s a good thing. (Can a yellow iPod or a commercial showing a silhouetted Lance be far behind?) Given the amount of people at my health club who wear the signature white earbuds, this is almost a no-brainer. But what I really want is an iPod that will work out for me.